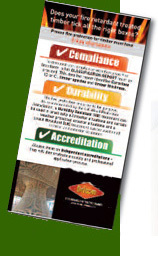 If fire protection is required then it is vital that you choose a durable and accredited product that is fully compliant with the latest industry standards. The ONLY BBA certified fire retardant treatment (Certificate No 87/1841). Wood Protection Association (WPA) Approved HR (humidity resistant) treatment. DRICON fire retardant treated timbers and plywoods are suitable for use in interior and weather protected exterior applications. Waterbased, non-hygroscopic formulation - unaffected by high and fluctuating relative humidities. Working in partnership with Arch Timber Protection, Vincent Timber can offer the builder and specifier highly effective fire retardant treatments for timber cladding projects to help protect your work and reputation, as well as saving lives. Applied by vacuum-pressure impregnation in factory controlled conditions and kiln dried to an end use moisture content. For timber cladding, treatments are to Euroclass C in accordance with BS EN 13501-1: 2002 or alternatively to Euroclass B in accordance with BS EN 13501-1: 2002. The DRICON treatment is non corrosive to metal fastenings and fixings. However, metal fixings appropriate to the timber species should be used. timber available and is suitable for interior and weather protected, exterior applications. It is also a fully Approved Wood Protection Association humidity resistant treatment. Treatment does not significantly reduce strength of treated timber. An independent study by the WPA and subsequent fire testing by Warrington Fire confirmed the initial fire performance of DRICON treatment was maintained after 21 years of internal exposure.